We know we weren’t the only ones to witness an overload of engagement pictures during the holidays, followed shortly after by an inevitable influx on Valentine’s Day. And if you’re among this newly engaged set, you’ve probably already started exploring your options for a wedding venue. That’s why we thought we’d help you out with these quality suggestions. If you happen to be a guest at an upcoming wedding, you can get excited if it’s at one of the following locations. Not in Toronto? No problem. Here are our Vancouver and Montreal suggestions as well. 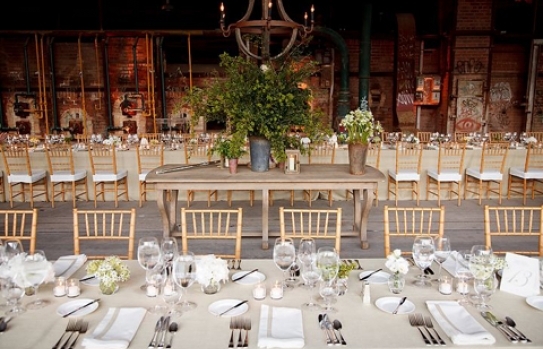 If you’re looking to take the old-fashioned romantic route, the historic Distillery District gives the feel of a European wedding (without the hefty travel tab for your guests). The Fermenting Cellar (built in 1859) offers an open space to make your own, with many windows and high, beamed ceilings. As an added bonus, there’s no rental cost for customers who use the in-house caterers. A relatively newer player on the event venue scene, the 3,000 square foot space on King West is open-concept with an industrial feel thanks to exposed brick walls, large windows, and a large bar area that will ensure minimal backlog as guests wait for drinks. 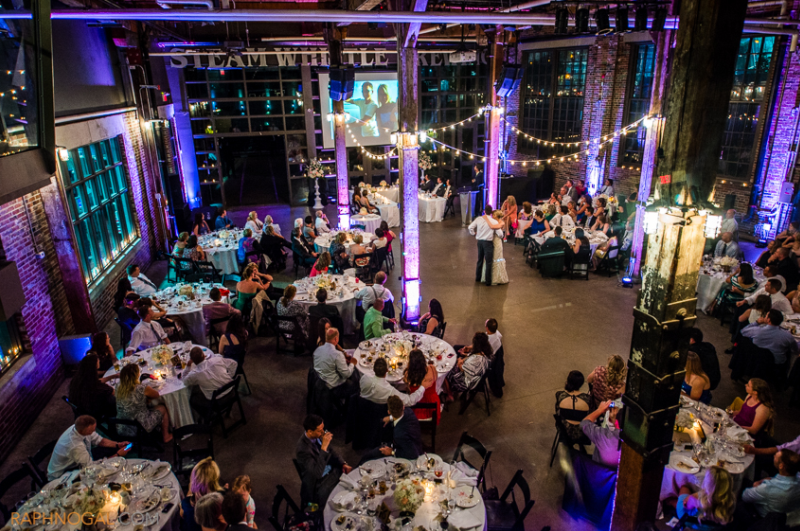 If you’re in the market for a summer wedding, a blank canvass to work with, and a serene outdoor space in the heart of the city, you’ll find it at the Evergreen Brick Works. Set amongst gardens and greenery, it’s a favourite choice for both eco-minded and outdoorsy urban couples. If you’re looking to go all out with glam and elegance, the historic Carlu on the 7 floor of the College Park is no stranger to some of the city’s finest galas (and our very own Notable Awards). To keep it central with a view, the TIFF LightBox’s Malaparte offers some of the best views of the city – both above and below – along with some seriously quality food thanks to the beloved Oliver & Bonacini brand. This one shouldn’t need that much explaining – it’s a castle, after all. If you’ve dreamed of that fairytale wedding since childhood and have a royal wedding worthy budget, the castle provides the perfect backdrop for your big day. 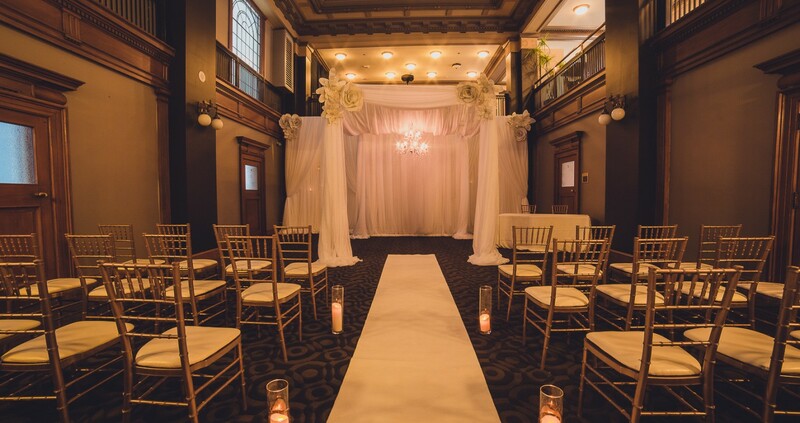 For a distinctly Toronto wedding that’s rich with history, the St. Lawrence Hall offers a full floor on the third level of a stunning heritage building on King East. Of course, it’s just a block from the iconic St. Lawrence Market, making for distinctly Toronto photo shoots. If you’re a fan of the Queen West hipster hotel route, The Gladstone Hotel makes for a no-fail option – and there’s room for guests to crash. A far cry from the typical luxury hotel options, a wedding at the historic piece of the city wedding will have as much character as your wedding guests do. For a wedding infused with a little culture, tie the knot next to a work of art at the AGO. The building’s stunning architecture and artistic masterpieces provide a far from typical backdrop for your shots. If flowers are your thing, and you have your mind set on a perfect outdoor wedding, tie the knot in the middle of the incredible Allen Gardens. As an added bonus, you’ll save dollars on the florist tab. If you like the idea of getting married in a church, minus the religion part, the Berkeley Church is an amazing option. Though it retains the original stained glass windows and high ceilings, the spot is now a coveted event space. The slightly smaller Field House next door (complete with tree house) is also a great urban oasis for any wedding day. For a hipper, blank space to accommodate a wedding of any size, detail, or decor, 99 Sudbury is a reliable choice. Steam Whistle Brewery offers an airy, rustic interior, complete with photo-worthy views of the cityscape. Naturally, you won’t find a shortage of good beer (folks). Palais Royale is one of the few potential wedding venues that takes full advantage of the fact that we live on a lake. Among perks like contemporary art deco furnishings, an original stone fireplace, and a 30-foot vaulted ceiling, you’ll also find a two-tiered lakeside deck patio. The Burroughes Building – originally built as a department store over a hundred years ago – has been renovated to preserve its character. The open space features exposed brick, wood detailing, and high ceilings. You’re free to bring in your own vendors, and purchase your own alcohol and permit. The Design Exchange (the home of the former Toronto Stock Exchange) is not only home to countless design-forward events and exhibits, but also some seriously stylish weddings. Finishings include wood furnishes, marble detailing, and an assortment of murals by artist Charles Comfort. The Great Hall offers over 20,000 sq. 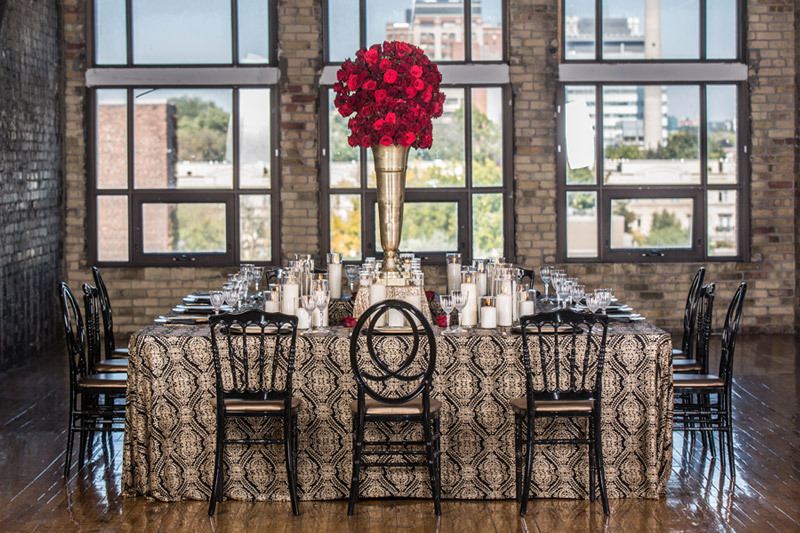 ft. of upscale premier landmark event venue destination with four distinctive venues in downtown Toronto. The unique landmark echoes of royalty, grandeur and unique wedding moments with a team who curates experiences and enjoys challenges to deliver a non-traditional wedding but always one that has a spark to it. The glass-filled Gardiner Museum includes stunning views of iconic Toronto spots like Queen’s Park and the Royal Ontario Museum. Catering is exclusively provided by the always reliable à la Carte Kitchen Inc. or the famous Jamie Kennedy Event Catering. If you want to take the restaurant route (and are prepared to pay a hefty tab), a wedding is just as special an occasion as any other to hit Canoe. Located on the 54th floor of the TD Bank Tower, the space offers truly breathtaking views of the city for your guests to take in, while enjoying some of Toronto’s most celebrated culinary offerings by Oliver & Bonacini. For a prestine Oxford experience, return to campus by booking your wedding at the romantic Hart House at the University of Toronto. The late-gothic building featured ivy-covered grey stone walls, polished stone floors, vaulted ceilings, and a selection of famous Canadian art. Both the quad and Great Hall make popular venue choices. The historic One King, built in 1914, retains many of its original features as a back-in-the-day bank, with everything from cathedral windows and high, restored ceilings, to original marble bank deposit tables and a photo-worthy 40-tonne vault in the basement.